The Quincy Chamber & QYP's are having a Christmas Party to kick off the holiday season. While this event is free we do ask that you please bring a present (or check donation) in support of Interfaith Social Services. Members are more than welcome to have their employees attend as well. We look forward to seeing you there! 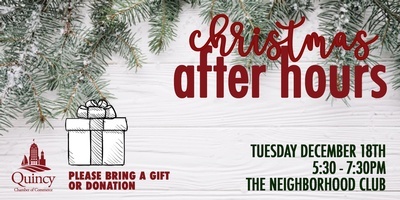 Please bring a present or check donation.